After a month long hiatus from the easel, I'm finally back with this painting that I did the charcoal sketch for weeks ago! I've not been slacking off, though, getting lots of work done on the business side of things. Anyway, I sealed in what I could still see of my charcoal line drawing and added in the rest with the paint. 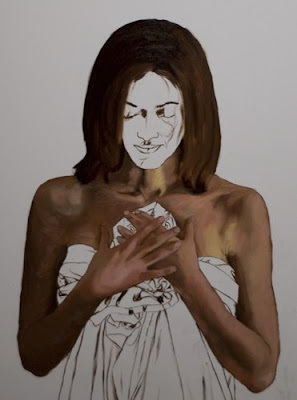 Then I started on some flesh tones, once again just trying to get the canvas covered. The values and hues are all off, but this will still work fine as a foundation. 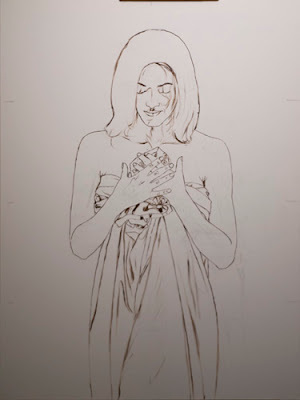 Tonight I plan to move on to the face and hopefully the drapery as well. Until then, I'm off to teach some classes!